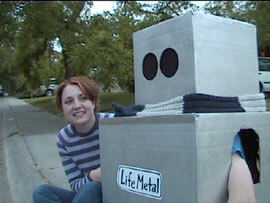 Cheer Up, Emo-Bot is a three part Intro/Interlude/Finale made for the Robotmedia Davis VIII showcase. A reject from the Punk Rock Robotics factory, Emo-bot wanders Davis in a haze of emo tunes. His circuits go haywire when exposed to cellphone radiation, and he switches to full laser attack mode. After an unfortunate cellphone user is vaporized, the robot returns to his normal, emo self. He sits on a sidewalk and broods over his actions, before being comforted and dragged to a punk show by a friend. The work received a great deal of applause and laughter from the Robotmedia audience, and many compliments after the showing.